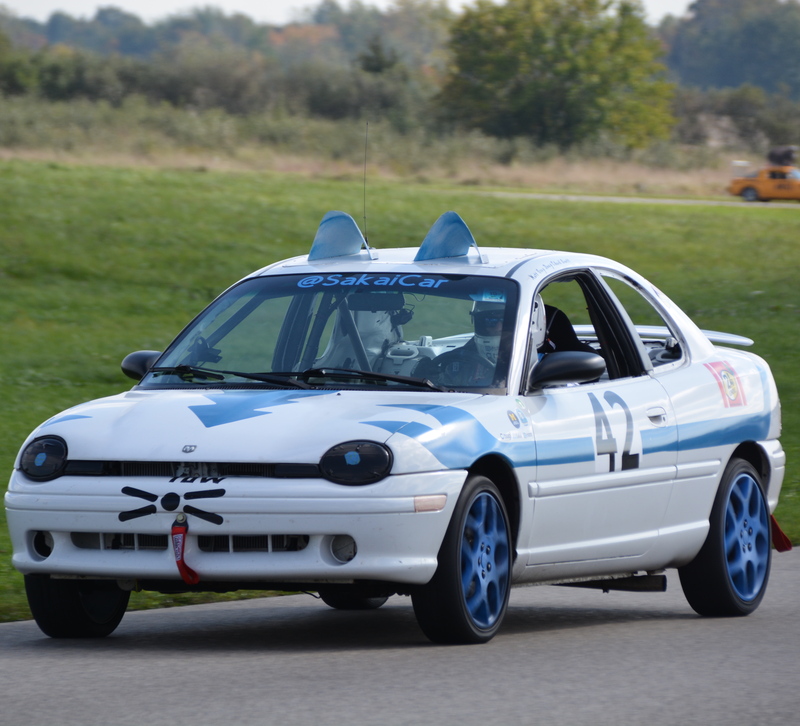 I'm the mascot for the Sakai Project. Sakaiger is a happy dancing creature. It is the logo of the hip, cool, underground, karaoke singing, car racing, silly elements of the Sakai Community (that is pretty much everyone). The Sakaiger is very much part of the lore of the Sakai Quality Assurance effort. 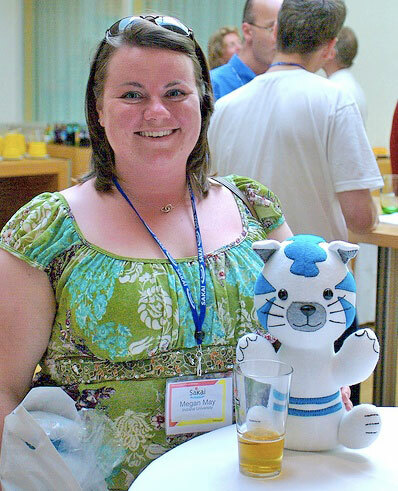 The first Blue Sakaiger is larger than the rest and was given to Megan May — the then Sakai QA director. 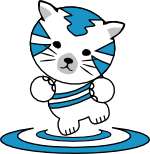 Sakaigers were first sighted in Amsterdam on June 13, 2007 at the Sakai Conference. Follow the worldwide travels of the Sakaiger via Flickr. Please upload your Sakaiger photos and tag them with the "sakaiger" tag. Andrew Thornton of CARET, Cambridge designed the original Sakaiger image. The first round of Sakaigers were hand sewn in Perry, MI. The stuffed Sakaiger is based on a Simplicity 3779 pattern for a stuffed rabbit [www.simplicity.com] - the pattern was adapted to make the Sakaiger more tiger-like. It is not possible to purchase a Sakaiger at any price! From Harriet —The original concept of a Sakaiger was mainly a silly pun thought up by those crazy folks at CARET, Cambridge. We have intermittently talked about other Sakai related animals (Sakainocerous, for example), but none of them really caught on as the Sakaiger did. We wanted to have a real implementation of a Sakaiger, and Andy Thornton drew one, which ended up looking rather like the tiger from the Weebls cartoon 'Kenya'. 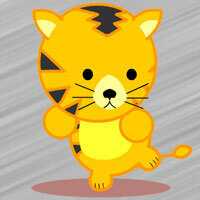 Andy also bought a Weebl tiger and lion (and t-shirt) for the office. 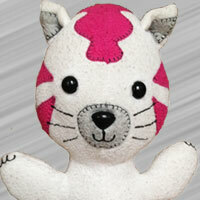 We customised our Weebl tiger a bit with a Sakai badge in its ear... The real life Sakaigers as realised by Chuck don't look much like the Weebl one (except they're clearly both meant to be tigers) - the Sakaiger is much taller and thinner and is smiley. Sakaigress (a.k.a. the pink Sakaiger) appeared March 28, 2008 and are given to people with special contributions to Sakai. Often the Sakai Executive Director awards a Sakaigress at their discretion. The Ninja Sakaiger (Black Sakaiger) are given to Sakai Fellows and are individually numbered with a serial number and the Fellow's name on the Sakaiger's shirt. To become a Sakai Fellow one must be nominated and chosen by the Sakai community. Sakaigers are traditionally given to the Fellows at the summer Sakai Foundation meeting each year. 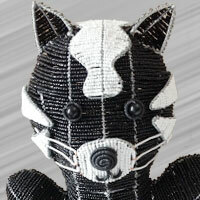 The Beaded Sakaiger is very rare and handmade of wire and beads and has its origins in South Africa. They are sometimes presented to Sakai Fellows. A relative of the Sakaiger is the Kenya Tiger from Weebls. Please visit the site, view the video and buy some of the totally sweet Weebl Stuff. 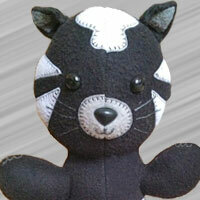 The Sakaiger stuffed animal and this web site are licensed under a Creative Commons Attribution 2.5 License - Charles Severance. You are welcome and encouraged to make derivative works of the stuffed Sakaiger and evolve the species through artistic improvement. Attribution is sufficient if you reference www.sakaiger.com if you display your artwork on your own web site. There is no need to put any attribtion on the derivative works themselves unless you want to — this is after all — art.